Graduate students Hayley Smith and Sylvia Guillory along with former research assistant Shaun O'Grady will be presenting at the Society for Research and Child Development conference. Their research topics cover task switching and visual working memory. The Baby Lab has a new Lab Manager! 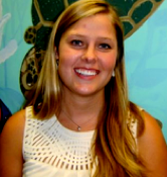 Emily Harris has received her MA degree from NYU and has worked in an infant cognition lab on an autism-sibling project before joining us. She was selected from 158 highly qualified candidates! Mohinish Shukla presents "How we complicate things for infants to make word learning easier-" a special talk on early language learning and development. "Dr. Shukla’s presentation at the Middlesex Lounge had the perfect blend of humor and informativeness. The audience was fascinated by the topic of language acquisition and Dr. Shukla presented this complex material in a way people from other fields of study could understand and relate to. The presentation sparked a great deal of discussion about early language learning and cognitive development and this conversation continued past closing." The UMass Boston Baby Lab studies adults too! Baby Lab Manager Annalisa Groth and Research Assistant Dan Harris represented the UMB Baby Lab at the national Anxiety and Depression Association of America (ADAA) conference in Chicago, IL this March. 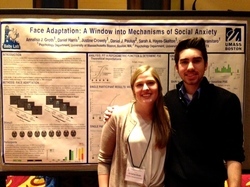 Annalisa and Dan presented research examining how individuals with high and low social anxiety process emotion in faces. The Principle Investigators on this project are Dr. Vivian Ciaramitaro and Dr. Sarah Hayes-Skelton. ​"Our experience at the conference was outstanding! Attending talks, symposia, and research presentations was both intellectually stinulating and an all around blast." Baby Lab alumnus Shaun O'Grady accepted to the University of California, Berkeley. Shaun Looks forward to his graduate program and will continue to build on what he learned at the lab. ​"The skills I learned during my intellectual journey here at the UMB Baby Lab have helped prepare me for graduate studies. However, it is the relationships that I have forged which will continue to influence my personal and professional development. I am honored to work with the dedicated faculty, supportive graduate students, and inspirational undergraduates in the UMB Baby Lab." Shaun is also the proud recipient of the National Science Foundation’s Graduate Fellowship! 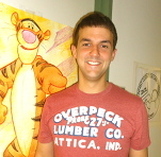 The Fellowship provides three years of funding for his PhD studies. Dr. Zsuzsa Kaldy presents her research at the University of Connecticut (Storrs, CT). 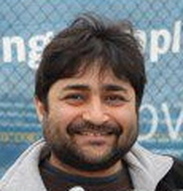 The title of her talk is "The truth is in the eye of the beholder: A novel infant working memory task based on predictive choice"
Dr. Mohinish Shukla presents his research at a three day workshop at the University of Massachusetts Amherst. The title of his talk is "Parallel processing of segmentals and suprasegmentals in speech segmentation." A group of 7th and 8th graders from Driscoll School visits the UMass Boston Baby Lab as part of their Science Solstice visit. Graduate students Hayley Smith, Doris Chow, and Sylvia Guillory along with Lab Manager Annalisa Groth submit abstracts for the Vision Science Society conference. Their research topics cover visual search, visual short-term memory, and cross-modal attention. The University of Massachusetts Boston's Baby Lab celebrates its 10th birthday this year. "We aim to understand how infants perceive the world," said the lab's founder, Psychology Professor Zsuzsa Kaldy. The lab is operated by the Psychology department in a division called Developmental and Brain Sciences (DBS). The three faculty members in charge of the program are Dr. Vivian Ciaramitaro, Dr. Mohinish Shukla and Professor Kaldy. Read more on the UMass Boston newspaper. Dr. Zsuzsa Kaldy's grant application to the Simons Center for the Social Brain at MIT recieves funding. This is a collaborative project between our team at UMass Boston (with Alice, Erik and grad students Frances Martinez and Sylvia Guillory) and MIT (Nancy Kanwisher and her postdoc, Jason Fischer). A brief project description is below. A growing body of work suggests that multi-level attentional factors may contribute to both the social and the non-social symptoms of ASD; fundamental differences in the weighting and prioritization of environmental information, especially during development, influences the way individuals with ASD process visual scenes, learn language, approach novel surroundings, and navigate social situations. In these proposed studies, we will test basic attentional mechanisms in 1.5-3-year-old toddlers with and without ASD (the earliest age the condition can be reliably diagnosed) using both behavioral (gaze direction) and physiological (pupil dilation) measures. We propose that early attentional disengagement problems on the task- (but not on the stimulus-) level are at the core of the attentional dysfunction in ASD. Drs. Zsuzsa Kaldy and Vivian Ciaramitaro will be participating in the Learning to Attend, Attending to Learn workshop in San Diego on November 7th. Dr. Kaldy will be presenting her research on increased task-specific attentional focus in 2-year-old toddlers with ASD. Dr. Ciaramitaro is presenting her research on crossmodal attention, where she describes learning to attend across sensory modalities. Watch the videos of the talks on the Learning to Attend, Attending to Learn website. Dr. Zsuzsa Kaldy will be participating in the 18th Conference of the European Society for Cognitive Psychology, which will be held between 29 August and 1 September, 2013 in Budapest, Hungary. The Baby Lab welcomes Doris Chow, Allison Fitch, and Hayley Smith to the UMass Boston community. They will be starting the Developmental and Brain Sciences Ph.D. program in the fall of 2013. Dr. Mohinsh Shukla will be presenting a talk about "Baby Eyes: Innovations in Research Paradigms for Infant Congition" at the annual EyeTrackBehavior 2013- Tobii Eye Tracking Conference on BEhavioral Research in Boston, April 9-10th. Register Today. Dr. Vivian Ciaramitaro and graduate student Sylvia Guillory will be presenting at the annual Vision Science Society meeting in Florida May 10-15th. The UMass Boston Baby Lab is featured in an article about the many laboratories in the Boston area that are studying development. Check out the article in the Boston Magazine. 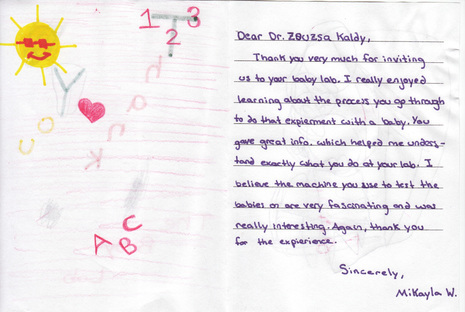 Dr. Zsuzsa Kaldy will be participating in the 2013 SRCD Biennial Meeting to be held April 18-20th in Seattle, Washington. She will be taking part in the Paper Symposium: Knowing 'What' is 'Where': New Findings on Object Individuation and Identification in Infancy. The title of her talk is 'Infants can Play the Memory Game: A Novel Anticipation-Based Object/Location Task'. A group of 7th and 8th graders visited the UMass Boston Baby Lab on November 30, 2012 as part of their Science Day at the school. Annalisa Groth started in September 2012 as the new Lab Manager of the UMass Boston Baby Lab. Annalisa graduated from the University of Wisconsin-Madison in 2012 and was selected from a pool of over 150 applicants.